Basketball fans in the UK or Europe will find that this game tips off in the small hours of Wednesday morning but for fans in Brazil and Rio, this is the last game of Tuesday evening. It features two teams that won their opening game so one team will maintain their 100% record after this game while the other team will drop to a 50/50 record. Argentina will have been delighted to get their campaign in Brazil off to a good start. Nigeria were hardly the toughest opponents the South American side could have faced but it allowed them to come to terms with the Rio crowd and the level of abuse they can expect to face in this tournament. Facundo Campazzo served up 19 points in the win and the South Americans will be desperate to quieten down the home fans once again in this match. Croatia grabbed a big win in their opening game, defeating Spain by two points, thanks to a massive showing in the fourth quarter. A 25-16 showing in the final quarter was more than enough to turn things around and give the Spaniards something else to think about. Bojan Bogdanović was the key player with 23 points in this win, which gives Croatia an ideal starting platform for the rest of the tournament. 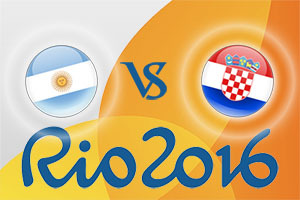 Basketball betting sites are backing Argentina to have the edge in this game but it could be too close to call. Taking Croatia at +2.5, at odds of 1.90, looks to be a sensible bet for this game. Anyone that is looking for the Over/Under market will find that going UNDER 160.5 at odds of 1.90 is a good way to get involved with the match. Bet Now! In the Race To 20 points, look to back Argentina at odds of 1.71 and if you fancy a good half-time/full-time bet, look to back Argentina-Croatia at odds of 7.00. With respect to who will achieve the highest scoring quarter in this game, back Croatia at odds of 2.05. The game starts at 0230 BST on Wednesday 10th of August.